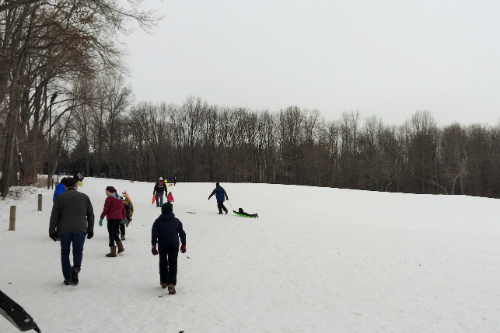 Last weekend the weather was perfect for sled riding, so we took the kids to one of my all time favorite sled riding spots. 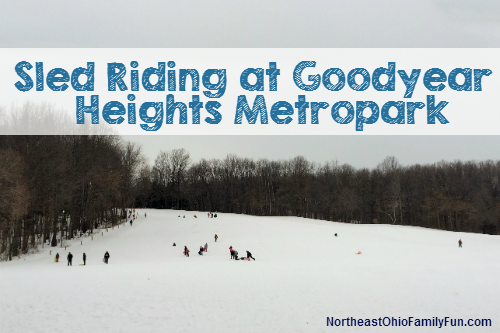 Goodyear Heights Metroparks Hill (part of the Summit Metroparks). 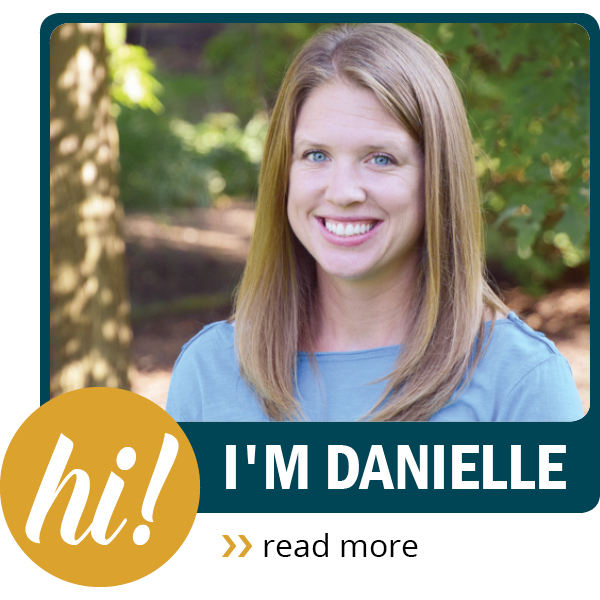 I have fond memories of going sled riding at Goodyear Metroparks as a child, and I knew that my kids would love the hill because it is easily twice the size of any hill that they have ever been sledding on. Those of you who are like me and get lost easily will appreciate the fact that you can see the hill from the parking lot. In fact, it's less than a 2 minute walk to the bottom of the hill. The walk up the hill takes quite a bit longer than 2 minutes though. Did I mention that this is a HUGE sled riding hill? Thankfully there is a clear walking path along the side of the hill and the ride down is well worth the walk up. We brought a circle sled and a traditional sled and both were really fun to use. Many people there also had inter tubes which worked really well. There were even some people using snowboards and skis! 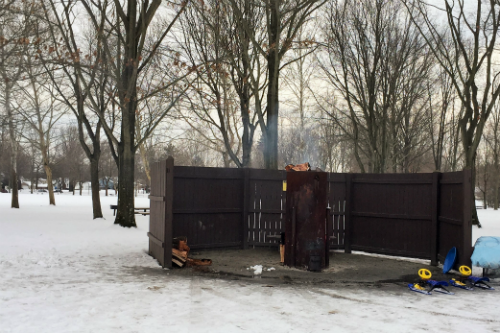 The Summit Metroparks also provides a nice fire-pit heater that you can used to go warm up. 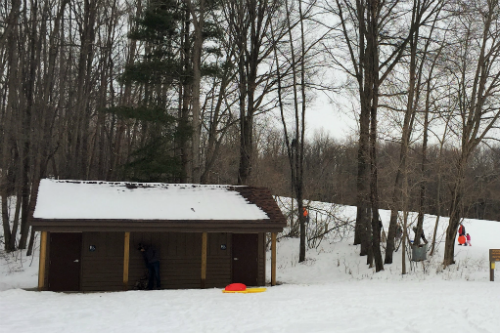 The heater is located near the bottom of the hill so parents can stay warm while the kids sled. While we were there a park ranger came and refilled the fire-pit with logs. 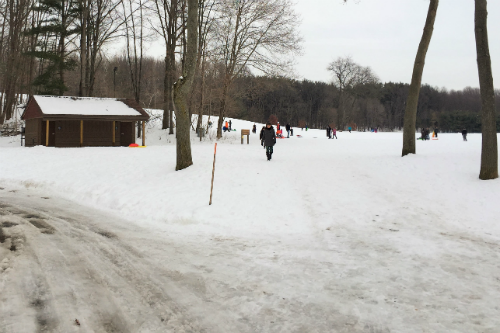 A big thanks to the Summit Metroparks for keeping the fire-pit stocked so we could all stay extra warm. The well kept bathrooms are another nice touch. And since chances are likely that at least one of my children will need to use the restroom, I always appreciate a nearby clean bathroom. 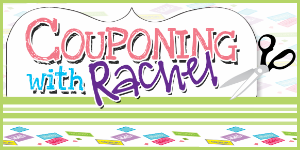 Conveniently located near several gas stations where you can stop for hot chocolate after your trip. Or better yet, make your own hot cocoa and bring it along. Want to find out more about the other local hills? 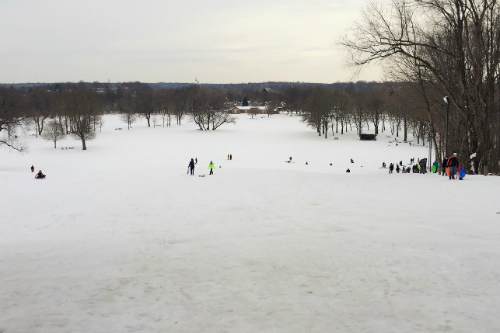 Check out the list of Top Sled Riding Hills across Northeast Ohio.